1912. 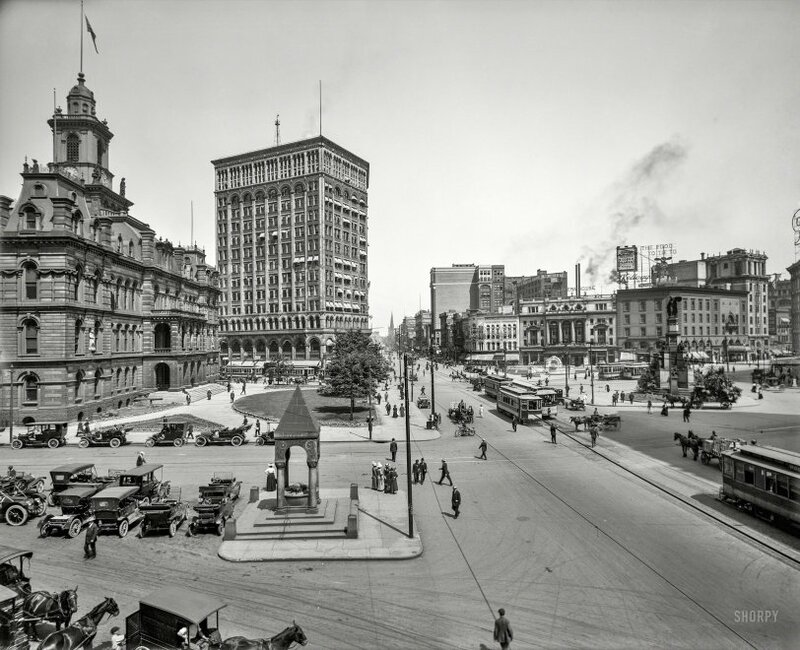 "Campus Martius, City Hall and Detroit Opera House." Other points of interest in this view along Woodward Avenue at Fort Street include the Bagley Memorial Fountain, Soldiers' and Sailors' Monument and Majestic Building. 8x10 inch glass negative, Detroit Publishing Company. View full size. Submitted by fwphoto on Thu, 03/30/2017 - 7:44am. The motorcycle the young man is walking across the street I believe is a 1912 Indian twin cylinder single speed. Submitted by wally on Wed, 03/29/2017 - 6:45pm. That is a very skillfully made old photograph - good architectural photography. Submitted by EastsideAl on Wed, 03/29/2017 - 5:03pm. The Bagley Fountain is actually a drinking fountain. It now sits a few blocks east of this view on Cadillac Square. The fountain was a bequest to the city from former Michigan governor John J. Bagley, who had made his fortune in the tobacco business and was one of the people most responsible for Detroit's status as a center of the U.S. cigar industry in the second half of the 19th century. He was also a temperance man, who felt strongly about the availability of fresh, clean drinking water. The Bagley Fountain is the only structure in Michigan designed by the great American architect H.H. Richardson.